Have you ever had to pack an overnight bag and wanted to take your Wang with you but found that it's too big to fit comfortably? That's where the FuzzyGreen® 5ml Unisex Travel Perfume Atomizer Pump Spray Bottle comes in handy. It holds 1/6 oz. of your favorite parfum de toilette which is enough to make you smell like a tart's boudoir for an entire week. This is such a smart and cool gadget that no woman (or metrosexual man) should be without. Who wouldn't want the option of taking a discreet phial of love potion number 9 with them without carting the whole 3 oz. bottle around with them. Plus they are available in 3 colors so you can pack 3 different smells and decide later which one you want to use. The perfume is injected into the bottle through a valve on the bottom. Just remove the squirter from your big bottle of perfume and insert the exposed nozzle into the base of the mini sprayer and push down. 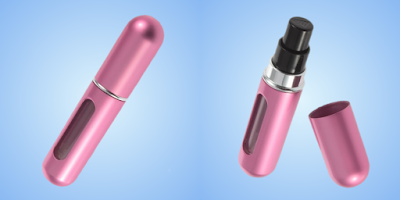 The perfume shoots into the mini sprayer and you are ready to rock and roll. At first it was a challenge to get it all aligned, but I mastered it pretty quickly. The first few squirts were a little stiff, but once I got used to the required pressure, things got much easier for me and I was able to direct the precise amount of squirt to the exact location desired. So far I have no leaks or malfunctions to report, but it did take an age to ship through amazon. It came direct from Asia and took almost 4 weeks to arrive, but it did ship for free, so if you are planning a trip, order this a month ahead of time. Overall, I am a fan of this portable atomizer. I have used it numerous times and will continue to get good use out of it. It is very lightweight and because of this, it feels a little cheap, maybe because they don't cost very much. I would gladly pay a little more for something slightly more rugged, but even so I gave it a 4/5. Disclosure: I received this item for free for evaluation purposes. The review above is my own honest and unbiased opinion.